Paediatric amblyopia (PA; “lazy eye”) is the most common vision disorder in children, reflected by decreased vision acuity in an eye that is otherwise functions normally. Traditional PA treatments, such as patching, are slow, with the delayed patient rehabilitation creating a cascade of problems for the patients themselves (from low self-esteem to bullying), their families and the society. A substantial number of children never recover normal levels of visual acuity in the weaker eye. As such, there are several pertinent questions related to both the aetiology and rehabilitation of amblyopia. 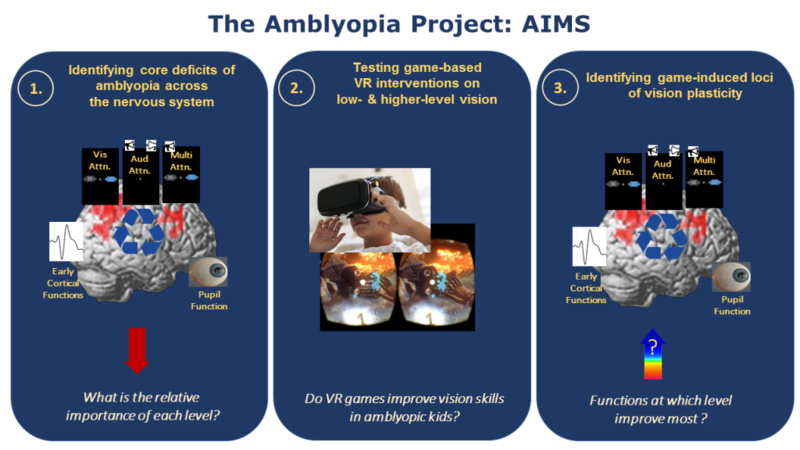 First, it remains to be shown whether intervention programs shown to improve visual and/or attentional functions in adults can rehabilitate PA – when turned into child-friendly, engaging yet attention-demanding games on in-home devices. Second, we need to identify tools to assess “functional vision” skills, such as reading, and whether game-based interventions improve them in PA. Lastly, we need to understand the role of low-level sensory and perceptual versus higher-level cognitive processes in driving basic and functional vision plasticity in PA. Our project aims to fill in these lacks in knowledge by assessing the relative importance of sensory and attentional brain processes in vision recovery in PA as a function of treatments focused on visual skills in context of engaging games delivered on virtual-reality devices. The project builds on the synergies across eHealth data-analysis solutions, new rehabilitation approaches and neuroimaging expertise present between the Information Systems Institute (HES-SO Valais) and University of Lausanne (Dept. of Radiology & the University Ophthalmology Service). If successful, the new rehabilitation approach could have the potential to be adapted to other paediatric as well as adult vision/sensory, cognitive and/or motor disorders.